The field of artificial intelligence (AI) is moving so quickly that even experts are having trouble keeping up with developments. So how can the rest of us get to grips with the dramatic changes that are coming? In an effort to provide a clearer picture of the state of AI, a team led by Stanford University has compiled the first index to track activity and progress in the field. The inaugural AI Index begins by telling readers that “without the relevant data for reasoning about the state of AI technology, we are essentially ‘flying blind’ in our conversations and decision-making related to AI”. The inaugural annual report is part of Stanford’s One Hundred Year Study on AI (AI100), a 100-year project looking at the effects of AI on people’s lives. 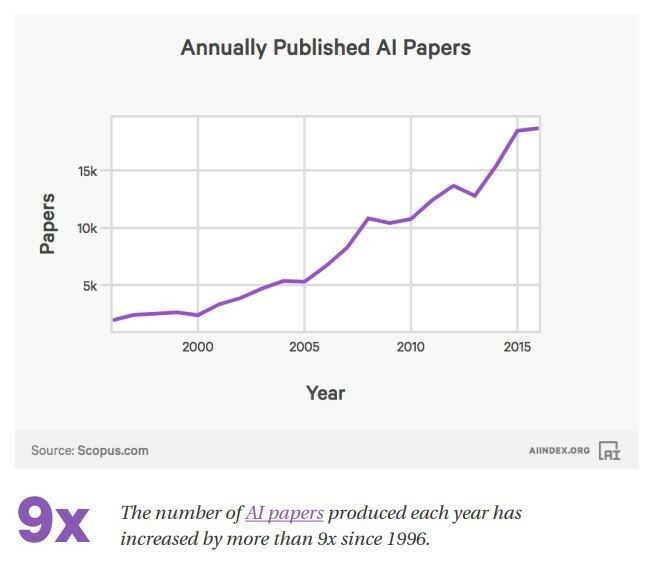 The number of published academic papers featuring AI has risen dramatically. There were nine times as many papers published in 2016 than two decades ago, approaching 20,000. Young people clearly think that AI is a key part of their future, as more and more students choose the subject at university. 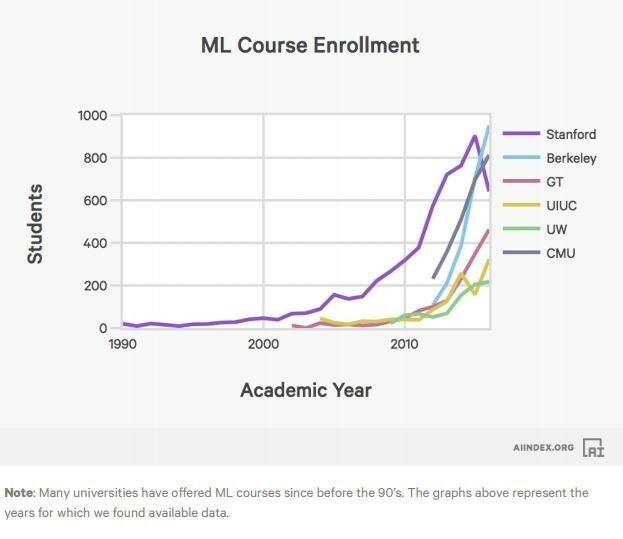 The number heading to Stanford, Berkeley, Georgia Tech and other US universities to study AI has rocketed in the last decade. And when it comes to finding a job, studying AI could prove useful as employers increasingly want people with skills in the field. 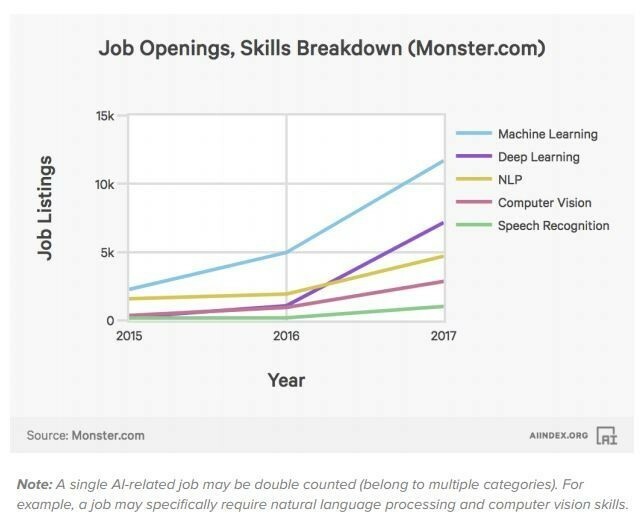 An analysis of global employment site Monster.com shows that job openings requiring machine learning and deep learning skills, two major components of AI, have more than doubled in the last year. 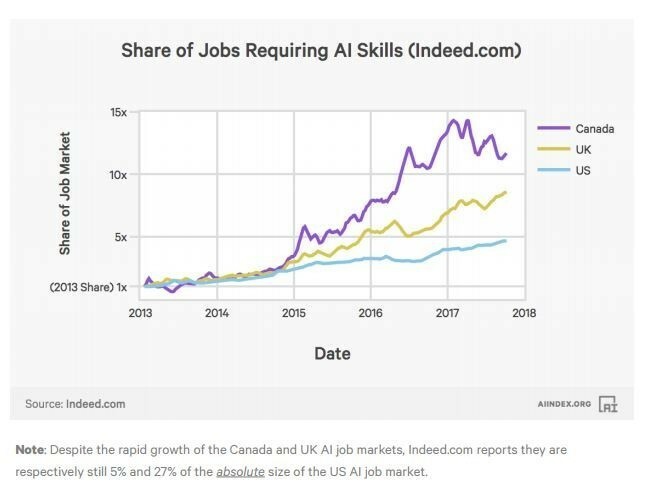 And the United Kingdom, the United States and Canada have all seen growth in jobs requiring AI skills, according to job site Indeed.com. A significant number of these jobs are created by start-ups. These companies are able scale up thanks to the money put in by investors. 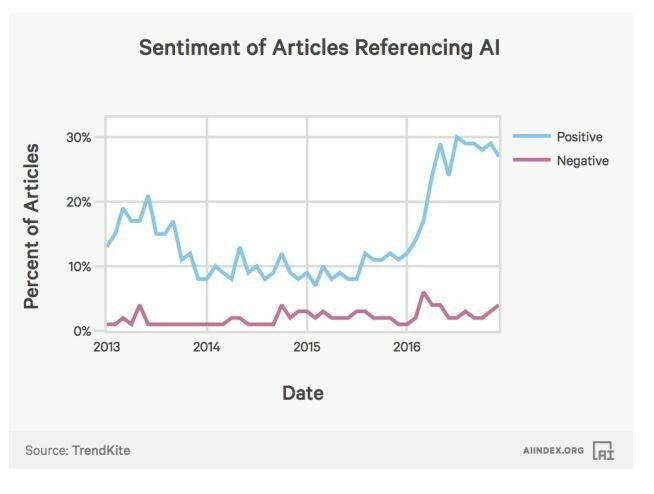 And investors are bullish on AI. 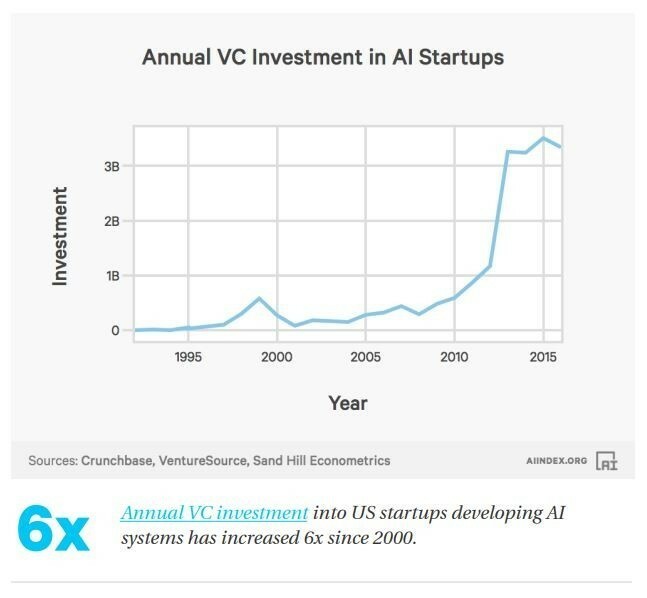 Investment into AI start-ups by venture capitalists has increased sixfold since 2000. 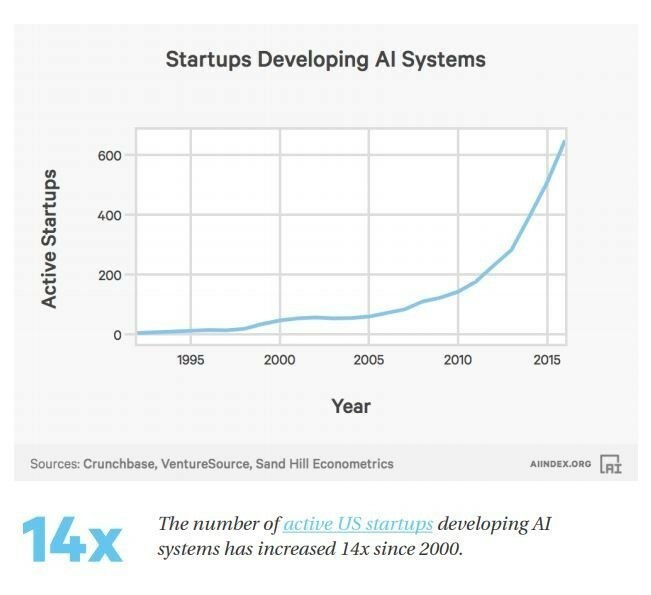 Meanwhile the number of start-ups working to develop AI systems has increased 14 times since 2000. While most agree that automation will completely transform the workplace, the jury is still out as to what extent the labour market will be affected. There are signs that automation is already happening. 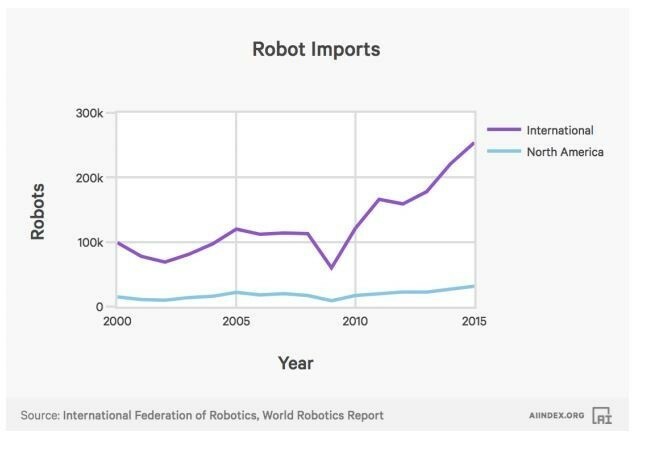 Internationally, robot imports have risen from around 100,000 in 2000 to around 250,000 in 2015. In the US the rise is more muted, but still significant. How do we feel about AI? How do we feel about AI? Overall the media are far more positive than negative. However in the latter half of 2016 the number of positive articles dipped, while negative coverage increased slightly. The index shows that AI systems tend to perform well on specific tasks. For instance when IBM’s Deep Blue beat chess champion Garry Kasparov in 1997. But some attempts at interpreting conversation have been problematic, with AI programs learning racism and sexism and other prejudices from humans. More recently, there have been exciting developments in the health sector. A 2017 study showed that AI could recognize the symptoms of skin cancer as well as a dermatologist. The AI Index says that while it covers a lot of ground, there are many other areas to be explored, such as chatbots, which are a burgeoning area of AI. The authors also admit that their report is in no way comprehensive, saying that “China today is astounding but outside the scope of this report”. There is no doubt that AI is becoming an important presence in our lives, but what is it capable of, and what will the consequences be? These questions remain unanswered.